We are pleased to announce that The Doyle Hockey Development summer camp for girls will be returning to CEGEP St. Laurent in Ville St. Laurent from June 26th 2017 - June 30th 2017. Novice, Atom and Peewee players of all levels welcome. Players will be split into one of two groups accoring to age and skill level. Our energetic staff of trained female instructors are dedicated to the ongoing development of all participating players. It is our intention to help each player reach her full potential by using state of the art teaching progressions and techniques. A combination of position specific on and off ice training along with video, sport psychology and nutritional sessions will be utilized to offer each athlete a complete hockey curriculum. The on ice session will help to improve skating ability, power, balance, stick handling, shooting and passing. Groups will be diveded according to both age and skill level. DHD is well aware that goaltenders are often forgotten. 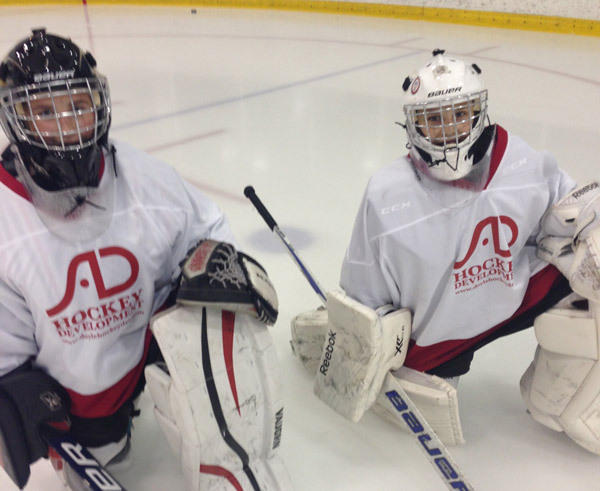 At all of our camps, goaltending development is taking very seriously both on and off the ice. During the morning ice session, goaltenders will receive 35-40 minutes of goalie specific training. At this time, our qualified goalie instructors and shooters will help each goalie improve their skills, refine technique, and increase their speed of movement. The remainder of the morning ice session, the goalies will face shots from the other players in the group as the DHD staff create an intense practice that involve flow drills, as well as a variety of small space games. In addition to the goalie development the girls recieve during the regular practice session, we have added an additional goalie practice from 12-1pm daily. The camp day runs from 9am to 4pm daily Monday to Friday. Each player will be on the ice a total of 3 hours (Two 1.5 hour sessions). ***Off Ice and classroom sessions take place when the players group is not on the ice. Opportunities to train and learn from a highly skilled staff of female hockey players who serve as great role models for your daughters! Position specific drills for goal scoring, defense and goaltenders throughout the week. Small space games to highlight skill development, puck possession and control. Development of the complete player including goal setting, off ice training, sport nutrition and many more.